It's the meal in the South where we eat ham and squash casserole and coconut cake and drink Bloody Marys with our family in our finest Sunday attire. Honestly, I know it may be heresy, but I think I may like the Easter meal better than Thanksgiving. Just really always down for it. This year I have a huge family contingent heading to my house for Easter lunch which calls for major planning. One does have to twirl it up when it's Easter. Lately, I have been inspired by the fabulous tabletop offerings and new releases by Tory Burch, Amanda Lindroth and Land of Belle. I set the table for a photo shoot last week at a beautiful and amazing client's house and then turned it into my Easter table jam. I decided to lean in because I feel comfortable t.hat I am going to put this baby on repeat. Find the beautiful petal glassware, the raffia placemats, and the pink cabbage leaf salad plates by Dodi Thayer for Tory Burch at Tory Burch Home. (30% off with the code SPRING). 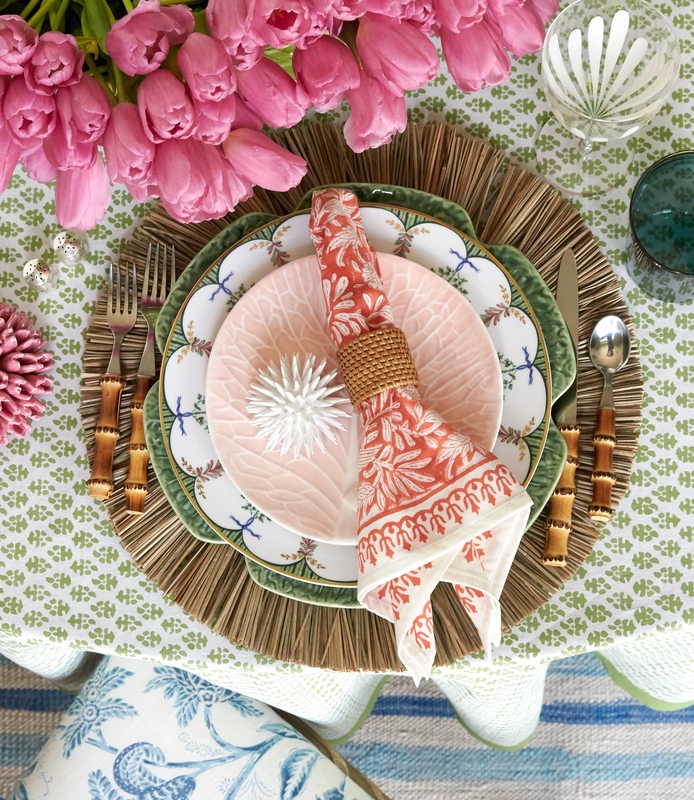 The Jasmine napkins and Batik tablecloth are from Amanda Lindroth's new line of linens. The flatware is by Juliska. The green cabbage plates are by Pinheiro Bordallo. And the gorgeous ceramic pink dahlia and white sea urchin are from my favorite Land of Belle. Be on the look out for great images of new work on my website next week.